During times of growth - it can fall onto managers themselves to reach out to their personal networks to recruit talent. A manager will add this workload onto their work that they’re actually meant to be doing for the company. Although this makes sense in the early going – since most of those initial hires will likely be people that they’re somewhat connected to. When your company is growing, the next round of hiring has managers sending messages to friends and family seeking their help in the networking game. It can helpful when considering the bottom line and you may be willing to forgo some of the production from managers. But it can quickly get to a point where enough is enough. And your company can start to suffer because time spent on the core business initiatives is being lost. And at some point, the manager’s will burn out. A job board presence is an effective tool to use for driving inbound candidates, but it’s the tip of the ice berg of the candidate pool. Job postings enable you to settle for the best "available" talent. And that’s what you are doing, settling. 90% of global professional are interested in hearing about new job opportunities, but only 30% are actively looking. By finding and engaging targeted people who are not actively seeking a career change can open the door to the pool of talent that you need. But, this is time consuming – it requires creative messaging and multiple outreaches. That takes advanced planning and constant adjustment to achieve results.You ideally want to be excited about the slate from which you are choosing and maybe even have difficulty making that choice. Those are signs of a strong, well-sourced talent pipeline. This requires a continuous, dedicated effort to sustain and manage. Dependence on job postings will not get you there. You may begin to notice crucial gaps in your company that need to be filled in order to take the next step. And the type of talent that needs to be brought in to fill those gaps has to have a wide variety of experience and rare but sought-after skills - requiring a detailed targeted search. At this stage of growth you have look at people OUTSIDE OF YOUR NETWORK – people you and your team don’t know yet and will need to find. And these types of candidates are hard to find - they aren’t going to be lurking on job board pages – looking for your posting. They’re going to be passive to the job market – but willing to listen if the right opportunity is presented to them. And that takes time and effort. In a high growth situation – prioritization is a big challenge. There’s never enough time in the day, so most of the time you pick things that need immediate attention. Next thing you know, hiring continues to fall lower and lower on your list. Perhaps you decide to just make a hire to get it out of the way and move on to avoid missing another deadline. But did you truly find the best person for the job? Or maybe you miss on your deadline completely and you can’t deliver you product on time or respond to customers because you are short staffed. You need help! The workload of recruiting is baring too much on your managers, and the idea of hiring someone full-time to take care of it seems like the ideal solution – but here’s the problem. What happens once you get through that huge growth spike in 6 months? Now you have a full-time resource on your hands and you have no flexibility on their workload. There is a time and place for hiring an internal team, but it is a matter of timing. You don’t want to jump the gun on this hire and do it too early. You have to think long term about it, is there going to be a steady stream of work for this full-time employee, or are they going to become an expensive and underutilized resource? Figuring cost is also key – can you afford the level of person that you need, which may even require supplementing that budget with additional resources and tools. And think about retention too – there is going to be a lot of time spent with training and bringing them up to speed – will this person stay with you for the long-term? Hiring a contract recruiter isn’t the ideal solution either. You aren’t bringing someone in that works for you. They can leave their contract at any time, leaving you hanging. 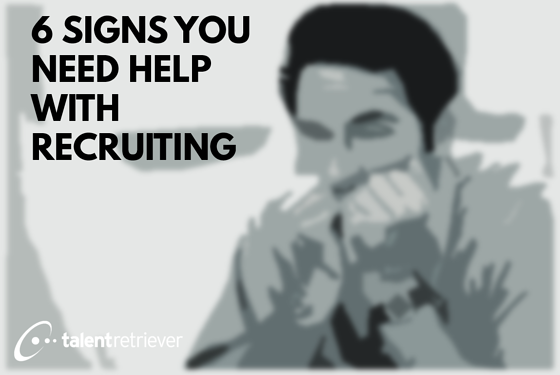 Generally, contract recruiters are limited in their skillset for hiring across multiple teams. A contract recruiter is not totally invested in your growth. You may have also determined a possible solution is to hire an agency. The trouble with that is the help is limited. There are still many pieces to the recruiting process that will need your attention. The immediate attraction of an agency is that they are “engaged” but not being paid until there is a hire. But what about the time you invest with them – to onboard and train their team, the time to pre-screen and interview the candidates. If you are hiring multiple people for one profile – you are paying a large fee each time – this is not a very cost-efficient way. This model can help you out of a bind, but it isn’t a default strategy. It’s not scalable and it’s a gamble that the hires being brought in will actually stick. It may seem like it is low risk, but keep in mind, an agency’s end game is the hire - that’s their best interest. Not necessarily your goals to grow. They may even be working with your competitors at the same time – vying for the same talent as you. And when things get hard they may move on to other jobs to fill and give up on yours. You are not getting the attention you deserve with agencies. All 6 of the signs I’ve gone over are extremely common, and they can sneak up on you before you know it. Hopefully by being aware of what to look for, you can get ahead of it before it’s too late, and the workload becomes suffocating. Guys check us out at talentretriever.com to look at an alternative solution when you’ve surpassed the capability of self-service hiring. Tons of information there for you to check. Be sure to like share and subscribe. Hope to talk to you soon.